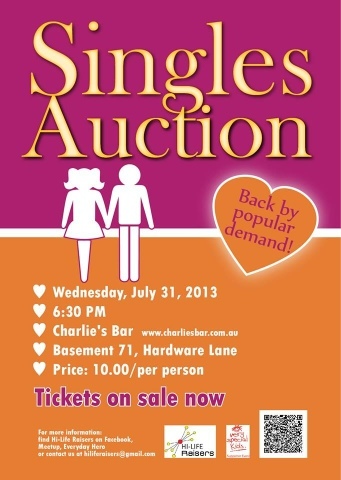 You all know how much I love a charity event with a twist, and tonight's Singles Auction at Charlie's Bar looks set to promise just that. A group of volunteer singles will be auctioned off for a dinner date with the highest bidder from the crowd (and you thought dating was putting yourself out there). All funds raised from the night will be dedicated to children's charity, Very Special Kids. The philanthropist lot behind the event is Hi-Life Raisers - a group of social people raising funds for a selected charity each year. This will be the biggest event they've done to date. Entry is $10 and rumour has it that Charlie's will be offering drink specials including a unique cocktail created just for the night. Raffle tickets and prizes will also be going around, all with the aim of raising as much money as possible for Very Special Kids. Of course, you don't have to be single to come along - and be rest assured you wont be up for auction as part of the crowd. Grab some mates, throw in a tenner and support Hi-Life Raisers as they do their thing for charity. Special thanks to lovely Sarah Kempson who brought this to my attention.